For some reason this project makes us think of the Light Cycles in Tron. You know, the bike forms around the rider after they grab onto the wand that makes up its controls? Certainly you’re not going to see a car form out of thin air, but this driving controller let you grab onto nothing to control a racing game. You can see that it uses a Kinect to map the body of the player and convert your movements into motion control. The demo video embedded below the fold shows the calibration step, followed by the available control options. Pushing the steering wheel forward turns on the nitrous, leaning forward or back accelerates and brakes, and a few arm signals let you navigate the game menus. This works by mapping gestures to keystrokes. [Rajarshi Roy] tells us that there’s a very raw code package available in their repository but the plan is to clean it up this weekend. They will also work on a Wiki, documentation, and a tutorial on teaching the software new gestures. We just don’t know what we like better, seeing the kinect extended as a gaming controller like this one, or using it in robotics like that quadcopter. I love the way they keep making things for this kinect, but this has to function worse than a Wii remote and that can’t be good. Yay! Another kinect non-hack that has no useful or neat application. It also solves an already solved problem, and in a worse way! Woo hoo! The only thing I have to say about this is that I’m amazed it wasn’t the first thing developed for kinect. I mean, I just assumed it already existed. It’s just kinda where my mind immediately went when I heard about kinect. But there we are. i don’t know if they exist in other countrys, but in my last kinder surprise (yes i sometimes buy them, of course only for the chocolate) there was a little toy car and a link to magic-kinder.com where one could play a simple browser game using exactly the same controlling mechanism, only it used the standart vga webcam built into any modern laptop instead of a kinect. i am still waiting for a cool application of kinect that wasn’t possible to implement using a normal vga camera.. This reminds me of that time Microsoft made Project Natal and demo’d Burnout via hands held in the air like a steering wheel. Wtf? The steering wheel is primarily a handrest. Who wants to sit there like a chimp for an hour, holding their hands up?? 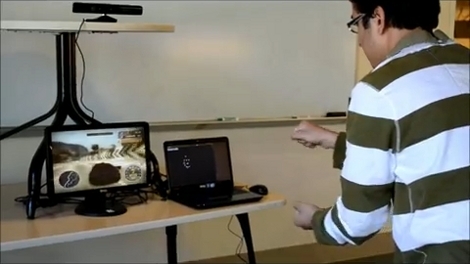 This was already done…before launch…by Microsoft…using the Kinect. It was one of the first demos they had; the Microsoft version even had you trying to use a shifter that wasn’t there in addition to a wheel that wasn’t there. One of the dumbest ideas in the history of video games…and that includes the Nintendo Virtual Boy. Still, no reason to bash the guy…he probably just did this to prove that he could do it, and to learn a little bit in the process. If you want to bash someone for making terrible motion controls, you have a wide selection of companies that not only make such controls, but who then charge people money to use them. Let me just say that the point of this was not to show off something that already exists in Xbox based racing games that support the Kinect. The point of this was to have a framework for other beginners like me to experiment with gestures and add Kinect support to existing PC based games. It is so sad that a proof of concept demo and a good gesture to the community earns so much hatred.. I was expressing no hatred for this, just pointing out to a previous commenter that it had someone had done it before. Wasn’t referring to your comment Joe :) The set of gestures for the nfs portion of the demo is anyway inspired by the Kinect based racing games! It was to show that the same functionality can be ported to the PC. My goal was to show the flexibility of the system for different types of games. Now if MS could get back to the stuff they showed and stuff others are doing with Kinect. That stupid thing is just taking up space.